I enjoy Jiggs dinner. Having said this, I realize this delicacy means different things to different people. In many places, it typically consists of salt beef (or riblets), boiled potatoes, carrots, cabbage, turnip, turnip greens (in season), bread pudding, dressing, pease pudding, and cooked turkey, chicken or beef roast. Condiments include mustard pickles (preferably homemade), bottled beets, cranberry sauce and butter. That, to me, is a cooked Sunday dinner. 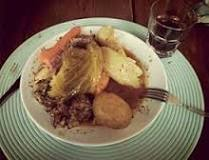 My Jiggs dinner is made up of salt beef, potatoes, carrots, cabbage, turnip, parsnip, brussel sprouts and pease pudding. That’s it. Nothing more, nothing less. Though a diabetic, I “mang” together this occasional ambrosial delight. Which recently brought Mart to my mind. He married Belinda from Western Canada. Sherry and I got to know them well while we were stationed in western Newfoundland. An accomplished cook, Belinda regularly regaled Mart’s tastebuds with a variety of dishes. As tasty as her cooking was, though, he missed certain dishes he had been raised on, especially Jiggs dinner. “What would you like me to cook?” Belinda asked Mart repeatedly. So Belinda made covert plans to surprise Mart. She gathered the ingredients for Jiggs dinner. For starters, she bought a tub of salt meat. At home, she dropped the meat into a large pot of water and boiled it for several hours. When the meat was tender, she added peeled vegetables. She boiled the mixture till everything was cooked. She set the kitchen table with her china and best cutlery, then brought out candles, in readiness for the special feast. Mart arrived home from work, dirty, tired and famished. Even before he opened their apartment door, he smelled the unmistakable odour of Jiggs dinner. Naw, can’t be, he thought. I must be daydreaming. Belinda couldn’t. But she could. Flinging open the door, Mart was met by Belinda, a broad smile on her face. The lights had been extinguished, replaced by glowing candles on the table. “God love you, my darling!” He planted a kiss on her lips. After a shower, Mart returned to the kitchen. She removed the pot lid. Now, the smell was overpowering. Mart watched as Belinda dug into the pot and lifted out their meal. His helping was generous; hers was modest. Mart, having flashbacks to his childhood, grabbed his fork and stabbed a chunk of salt meat. Forgetting his table manners, he jammed the morsel into his mouth. “Too hot, is it?” she inquired. “Oh.” Her smile had narrowed considerably. There was an icy silence before Belinda answered. Realizing that her husband wasn’t upset but could see the humour in the situation, Belinda’s tears slowly turned to smiles, then gales of laugher. “I can now see why the instructions you gave me were a recipe for disaster!” she said.